Napoleón Isabelo Veloso-Abueva (born January 26, 1930), more popularly known as Napoleón Abueva, is a Filipino artist. 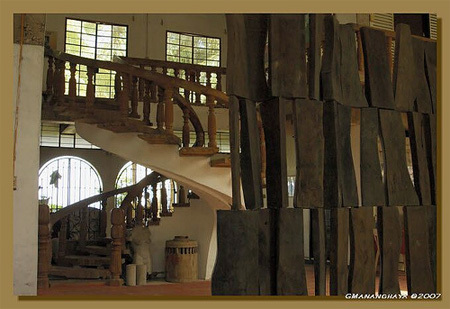 He is a sculptor given the distinction as the Philippines' National Artist for Sculpture. He is also entitled as the "Father of Modern Philippine Sculpture". He is the first and only Boholano given the distinction as National Artist of the Philippines in the field of Visual Arts. The Abueva's house is located near the Municipal Hall of Duero. It can be seen along the highway. The building beside the highway is the one he designed when he and his siblings were planning to set up a bank. His house is further down from the road, just by the beach. It's like a ship inside. National Artist Napoleon Abueva was born on Jan. 26, 1930 in Bohol. The sculptor -- whose works include the double crucifix inside the Parish of the Holy Sacrifice at the University of the Philippines in Diliman, Quezon City, and the Transfiguration, a towering Christ figure at the Eternal Gardens Memorial Park in Caloocan City -- studied at the UP School of Fine Arts under Guillermo Tolentino. Napoleon Abueva, nicknamed Billy, was born on January 26, 1930 in Tagbilaran, Bohol to Teodoro Abueva, a Bohol congressman and Purificacion (Nena) Veloso, president of the Women’s Auxiliary Service. His father was a friend and contemporary of former Philippine President Manuel Roxas and Ambassador Narciso Ramos. He was a member of the Provincial Board, and later became the Provincial Governor of Bohol. He ended his career as a Congressman in 1934. Both of Abueva's parents died serving their country. Abueva has six other brothers and sisters: Teodoro (Teddy), Jr., now based in New York, USA; Purificacion (Neny -deceased), married to Atty. Ramon Binamira (dec.) of Tagbilaran City; Jose Abueva (Pepe), former president of the University of the Philippines; Amelia Martinez (Inday), now living in Chicago; Teresita (Ching)Floro, now living in Sydney, Australia; and Antonio (Tony), a landscape artist who met a tragic fate aboard Princess of the Orient; his body has not been found. In 1943, at the height of the Second World War, Napoleon Abueva became an unwilling victim of the atrocities of the Japanese. With his father, a leader in the underground movement, and his mother in the women's Auxiliary group, the family was hunted. His parents were captured, tortured, and killed in Valencia. Billy was then only 14 years old, but this did not spare him from the brutality of the invaders. He accompanied his grandmother to Ilaya, Duero where they were captured by some Japanese soldiers. His grandmother was later freed, but he was hog-tied, brought to Guindulman, and tortured for more than a week. He lost his front teeth, and the blue-black marks on his wrists and ankles took weeks to heal. As a young boy, Billy studied at the Tagbilaran Elementary School, and later at University of Southern Philippines, Holy Name College (now Holy Name University), and Rafael Palma College (now the University of Bohol) before making it as a sculptor. A home-grown talent, he was given a break in 1951 when he won the Pura Villanueva-Kalaw Scholarship. He then took up a Bachelor's degree in Fine Arts at the University of the Philippines where he graduated in 1953. This was followed by a Fulbright-Smith Mundt Scholarship in 1954-55, after which he got a foreign Students Scholarship at the University of Kansas (1955-56). At the same time, he won another scholarship at the Instituto de Allende in Mexico City which he did not avail due to conflict in schedule. It was also in 1955 that he finished his Masters in Fine Arts at the Cranbook Academy of Arts, U.S.. In 1956, he attended Harvard University for another scholarship grant. 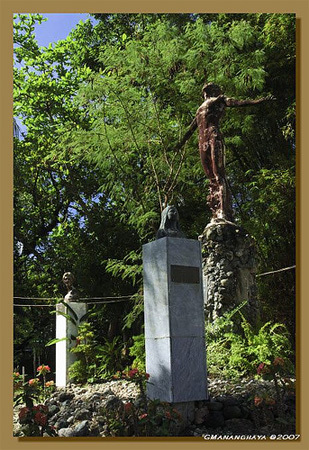 At U.P, one of his mentors was Guillermo Tolentino, also a national artist, who created the oblation at the university entrance. Abueva has helped shape the local sculpture scene in the Philippines. Being adept in both academic representational style and modern abstract, he has utilized almost all kinds of materials from hard wood (molave, acacia, langka wood, ipil, kamagong, palm wood and bamboo) to adobe, metal, stainless steel, cement, marble, bronze, iron, alabaster, coral and brass. In 1976, he was awarded the status of National Artist of the Philippines by then President Ferdinand Marcos. He was the youngest recipient of the title at age 46. Some of his major works include Kaganapan (1953), Kiss of Judas (1955), Thirty Pieces of Silver , The Transfiguration, Eternal Gardens Memorial Park (1979), UP Gateway (1967), Nine Muses (1994), UP Faculty Center, Sunburst (1994)-Peninsula Manila Hotel, the bronze figure of Teodoro M. Kalaw in front of National Library, and murals in marble at the National Heroes Shrine, Mt. Samat, Bataan. 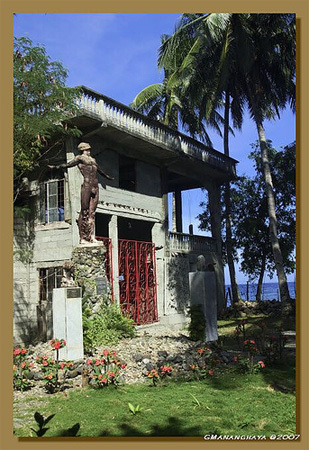 One masterpiece he dedicates to the Boholanos is the Sandugo or Blood Compact shrine in Bool, Tagbilaran City, a landmark at the site of the first international treaty of friendship between Spaniards and Filipinos. 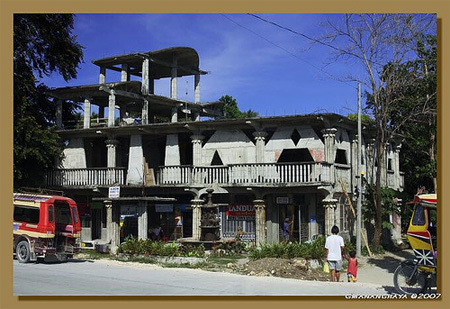 This is now a tourist attraction in Bohol province. 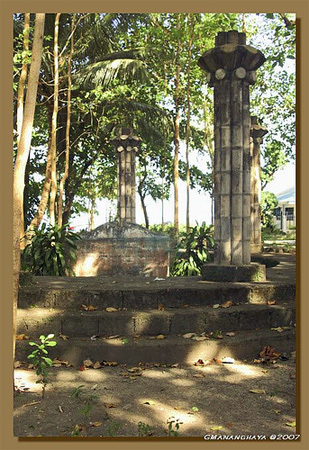 This shrine is an expression of Abueva's awareness of his roots, and a manifestation of his artistic talents. Abueva also performed the death mask procedure of the late Fernando Poe Jr. in 2004, as well as that of Ninoy Aquino in 1986. Both masks are now displayed at the Center for Kapampangan Studies, Hacienda Luisita, Tarlac. Incidentally, he also made a death mask of Cardinal Sin. He is married to Cherry Abueva, a psychiatrist, and has three children, Amihan,Mulawin, and Duero.